SUMMER NAMM 2017: Furch Guitars, which has announced the release of a new limited edition model at Summer NAMM, is a luthier with quite the backstory. Born in communist Czechoslovakia as an underground, 'garage' company in 1981, Furch Guitars was the product of founder František Furch’s illicit passion for making musical instruments. The company was only officially founded after the Velvet Revolution of 1989 saw the communist puppet government swept from power, and has been steadily expanding its reach ever since. Now the company is in Nashville with its Furch Limited 2017-LP line; a luxurious affair, it's an all-solid woods six-string crafted primarily from Alpine spruce, paduak and African mahogany. 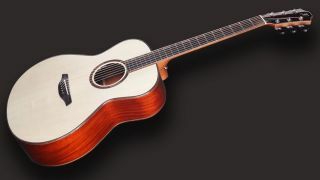 It's also available in four body shapes - dreadnought, grand auditorium, super jumbo and orchestra model, with prices starting at €2,509.